Last week, a Ford patent application appeared on the U.S. Patent And Trademark Office’s website. It was for an interesting new seat pattern in cars, a circular, completely non-aerodynamic design that would also allow for passengers to be facing each other, as if at dinner. Is this design as crazy as it looks? I don’t think so. All of which sounds kind of distressing, but it’s obviously for autonomous vehicles, and foresees a day when the front seats of a car don’t have to be forward-facing. You know how when you get on some trains there are some seats that are forward-facing, some that are rear-facing, while others that surround a table? That’s not a problem because the passengers don’t actually drive the train, of course. Similarly, in our future, in which The Machines drive our cars for us, there’d be no reason to necessarily sit in a seat in the front which faces the road ahead. This presents a threat to the age-old game of calling “shotgun” for the right to sit up front, but it also opens up a number of cool possibilities, like Ford’s design, originally filed in 2016 but made public April 12. That said, the idea of having seats “slidable” along a track is already giving me some motion sickness. 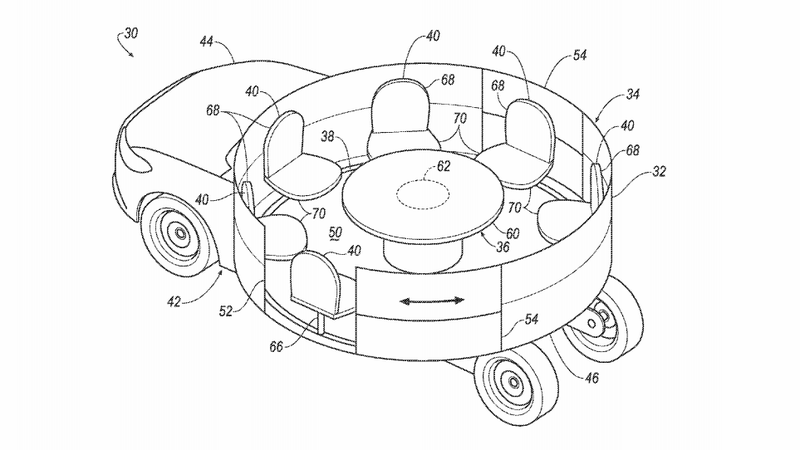 Here’s another mock-up from the patent, which looks like a carousel on wheels. Would I ride in this thing? Hell yeah. Would you?